Downtown: Los Angeles, CA USA Set #106 - Hero Composite: Car travels S on Hill St, on a clear evening in light traffic. Shot on RED Dragon. hd01:30Downtown: Los Angeles, CA USA Set #112 - Hero Composite: Car travels W through 2nd St. tunnel, turns N onto Figueroa St., and U-turn. Evening, light traffic. Shot on RED Dragon. hd01:30Downtown: Los Angeles, CA USA Set #103 - Hero Composite: Car travels E on Wilshire Blvd on a clear evening in light traffic. Shot on RED Dragon. 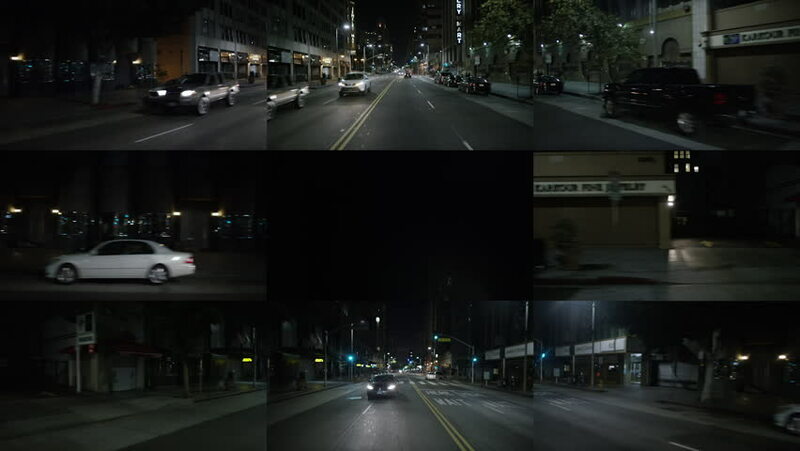 hd01:30Downtown: Los Angeles, CA USA Set #108 - Hero Composite: Car turns N onto Flower St., then turns E onto 2nd Ave. on a clear evening in light traffic. Shot on RED Dragon. hd01:30Hollywood: Los Angeles, CA USA Set #46 - Hero Composite: Car travels S on Fairfax Ave. on a clear evening in light traffic. Shot on RED Dragon. hd01:30Hollywood: Los Angeles, CA USA Set #52 - Hero Composite: Car travels N down Fairfax Ave. on a clear evening in light traffic. Shot on RED Dragon. 4k00:10NEW YORK - Circa December, 2016 - A nighttime establishing shot of a typical street corner in Manhattan with pedestrians walking past an exhaust pipe.